Well, good afternoon. I don't really know where you are when reading this, or what the time is...but right now it is about 17h40 on a lazy Sunday afternoon in South Africa. I am aiming to now post at least one blog post per week, if not more, but in a more "photo-of-the-day" style, with intermittent longer, more thoughtful posts. That way I can keep everyone updated on my photos as I process them from previous travels, and keep the site a little more active. 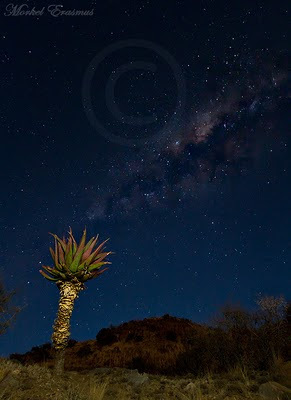 Those of you who've been to Africa before will know that there is just nothing like the night sky of Africa. In the USA I know they speak of Montana as "Big Sky Country", but in Africa it just seems that everywhere is "Big Sky Country". And if the daytime clouds and expanse don't convince you, the stars at night surely will. 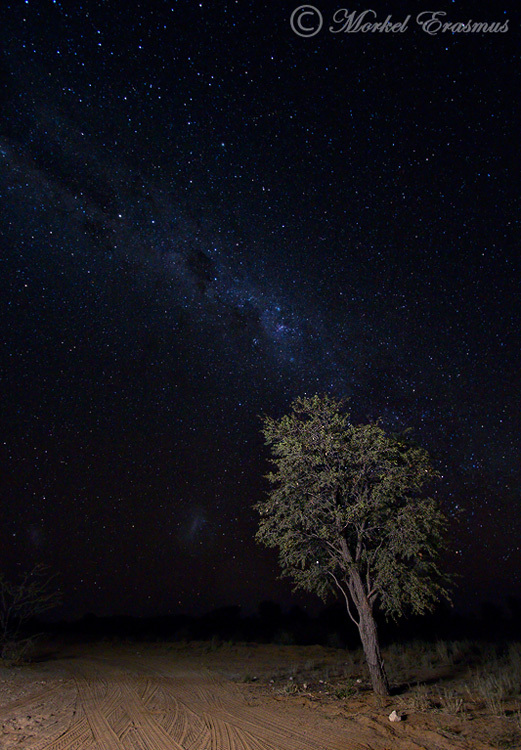 In general Africa has many places that are still quite devoid of serious "light pollution", which enables a much clearer view of the Milky Way and Southern Hemisphere "starscape". 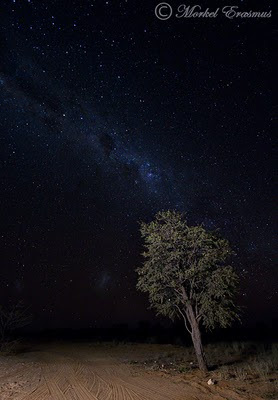 I have started dabbling in night-time photography, especially pertaining to landscapes, since investing in a camera that can handle higher ISO values with aplomb (partly due to being inspired by my friend Mark Dumbleton and his exceptional nocturnal photographs). This opens up a whole new world to the budding nature photographer, and for those lucky enough to visit places like Africa (or live in them), can have plenty of opportunities to explore this photographic genre. Many people will have seen examples of "Star Trails" where the photographer set up the camera to take a very long exposure to depict the rotation of the Earth around its axis, and how that changes the appearance of the night sky. Recently, with cameras being able to handle ISO-values of 1600, 2000, 2500 and even 3200-6400 with excellent retention of detail, another variation on the theme has emerged...so-called "starscapes". In short, the ISO value on the digital SLR camera translates to what old-school SLR users called "film speed", and is the actual sensitivity of the DSLR sensor to the intake of light. The higher this value, the more light can be absorbed, however this also results in higher-than-desired noise levels. With the increase in highly capable noise reduction software and the quality of newer cameras' images at higher ISO values, it has become possible to actually record great detail in the night sky. Coupled with selective painting of the foreground elements it can translate into enchanting images. 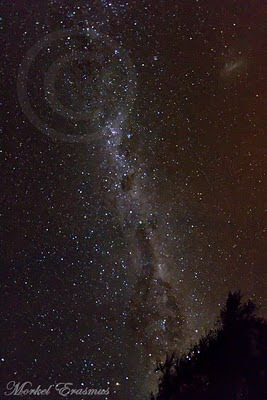 For these "starscapes" you need to be able to set your camera on ISO values of 1600+, oftentimes in the range of 2000-3200. You also need a lens which has a very wide aperture - typically 2.8, 3.5 or 4. This enables all the elements to work together to allow as much light as possible onto the sensor. 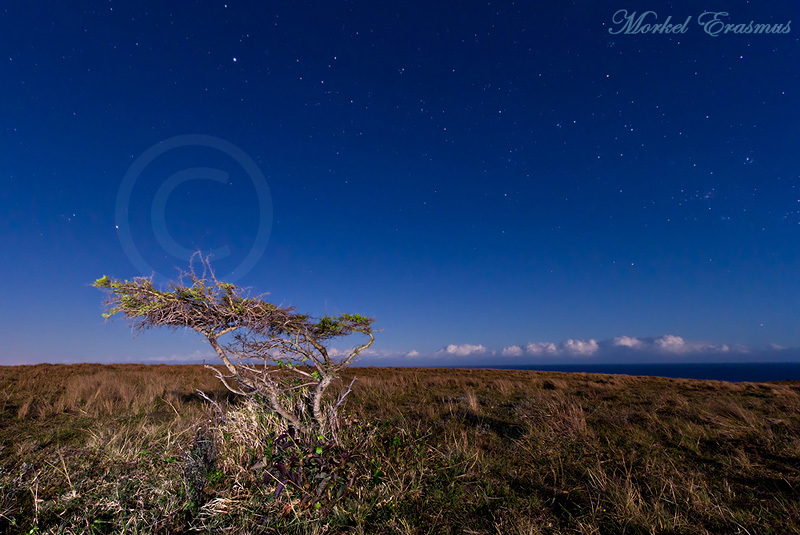 Keep in mind that you need to try and keep your shutter speed to below 30 seconds in order to minimise the effect of Earth's rotation on the stars in your image. I typically use a flashlight to help the camera focus on something not too close in the foreground, and during the exposure I will selectively paint the areas of the foreground I want to illuminate with a flashlight. To get a warmer tone out of the light you are using, you can either cover it with an orange gel or cellophane paper, or like me just reflect the light from the palm of your hand. Make sure you aren't standing directly behind the tripod, rather illuminate from either side of the camera. Also bear in mind that having a fullish moon will inhibit the amount of stars that are visible. For the image below I was fortunate to have the full moon just rising and illuminate the kopje behind the aloe, providing a bit more depth to the landscape. As demonstrated above, the moon can be a helpful ally, and even at times when it inhibits visibility of the stars, it can transform the intended photo into something better. In the image demonstrated below (which was captured on the South African "Wild Coast"), I only hoped to get the little acacia tree lit with some stars in the background, but the full moon added so much light to the scene that I was able to capture the Indian Ocean in the distance along with the rolling bank of clouds that was coming in on the horizon. As you can see, I actually started dabbling into night-time photography backwards...and it was only on our recent cross-country trip that I was able to attempt my first "star-trail" image. 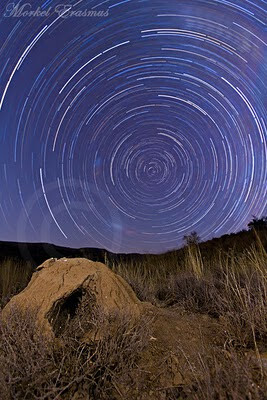 This image was taken in the Karoo desert, and I made sure my camera was set up pointed towards the Celestial South Pole. My dad taught me when I was very young how to determine the position of "South" when lost in the wilderness - you can find more information on the web, but Wikipedia explains it thoroughly. If the "Southern Cross" is visible, I normally take the distance between the furthest points, multiply it by 4.5 in the direction it's pointing and draw a straight line down from where this imaginary line ends. During this specific shoot I knew the full moon would rise by about 9pm so I had to get 9 exposures of 15 minutes each fired off before that (it had only gotten dark by about 6h30pm). The beauty of having a digital wireless remote is that I could set up my shot, prepare the focus point and settings and leave it to fire away. For this shot I used an ISO setting of 400 to minimise the noise and because I wasn't too concerned with "star movements" (actually - that was the point, capturing the movement). My selected foreground was an old termite mound. I captured the 9 exposures, making sure I illuminate the foreground sufficiently during one of the exposures, and proceeded to blend them in Photoshop. You can actually create one uber-long exposure, but that would greatly increase your noise-levels since the sensor heats up considerably during such a long exposure. Many people use the built-in long-exposure noise reduction of their cameras, but the problem then is that after taking e.g. a 90 minute exposure, your camera will proceed with noise reduction for 90 minutes (it actually takes another shot with the sensor closed and subtracts the differences). Here is the end-result...I am certainly going to play around with this a lot more in my future travels. There you have it. There are people a lot more proficient at this than I am - have a look at Mark's site as a start (link provided at the start of the article). It's the start of another week...give it all you have!